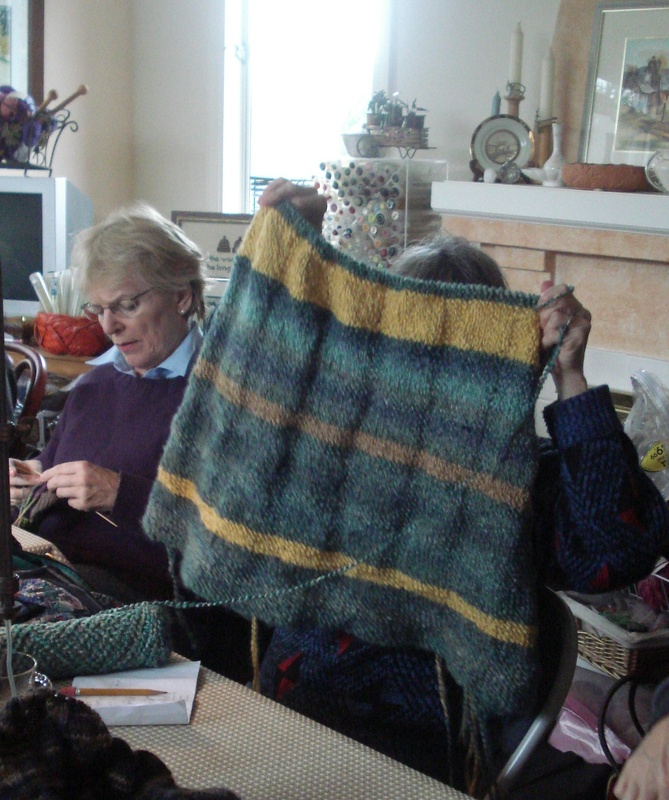 Photos from our Saturday knitting work shop….you can also check out this slide show! 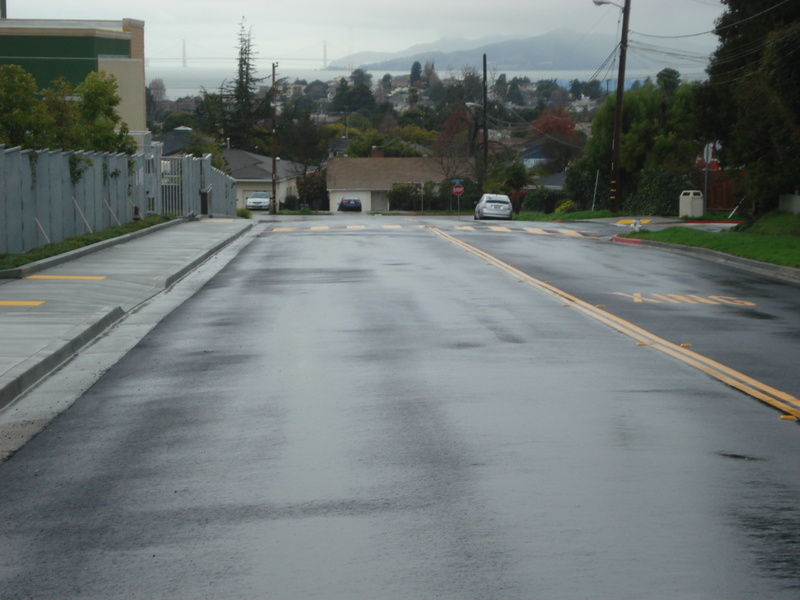 Some highlights of their projects. Susanne is knitting her Moderne Blanket from Mason Dixon in Brown Sheep’s Cotton Fleece and she is knitting the adult version. After she started she learned that her son purchased a Queen-size bed. 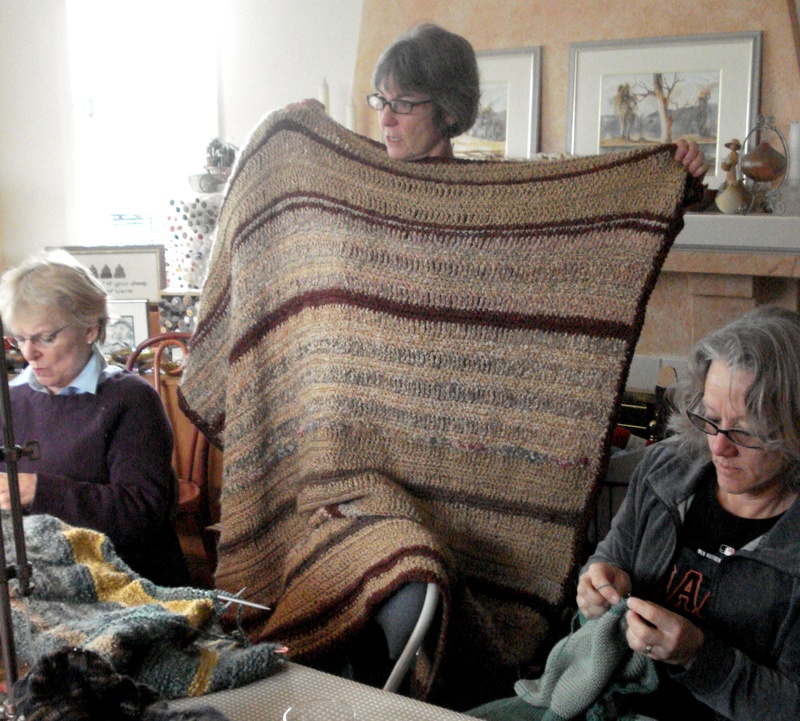 Her decision – continue knitting the original adult size and let this afthan be a throw for the Queen-size bed. Diane had two projects to share. 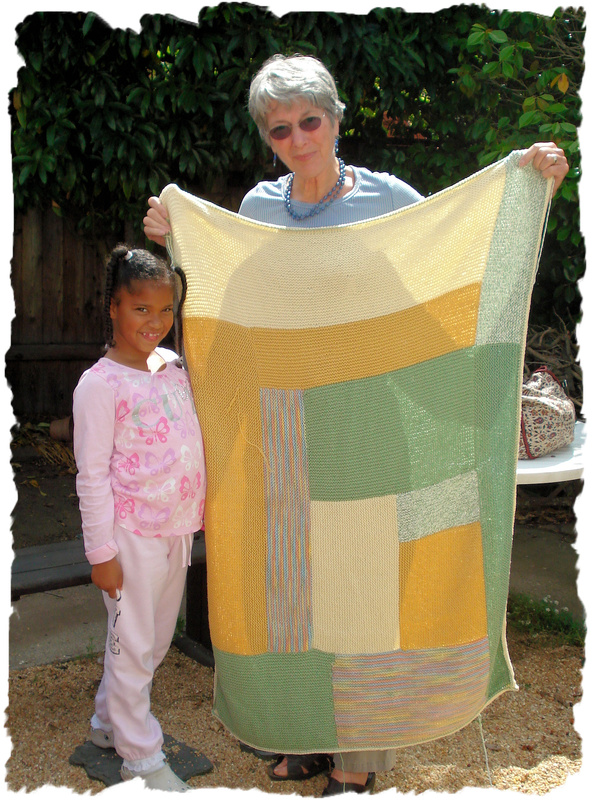 The first was the crochet blanket for her son Aaron which had been in process for 3 years. Her plan was to give this gift to her son on Saturday evening. I am remembering that I started a crochet blanket/afghan for my nephew when he was born and I presented it to him when he was 26. I am not quite sure what my hold-up was. 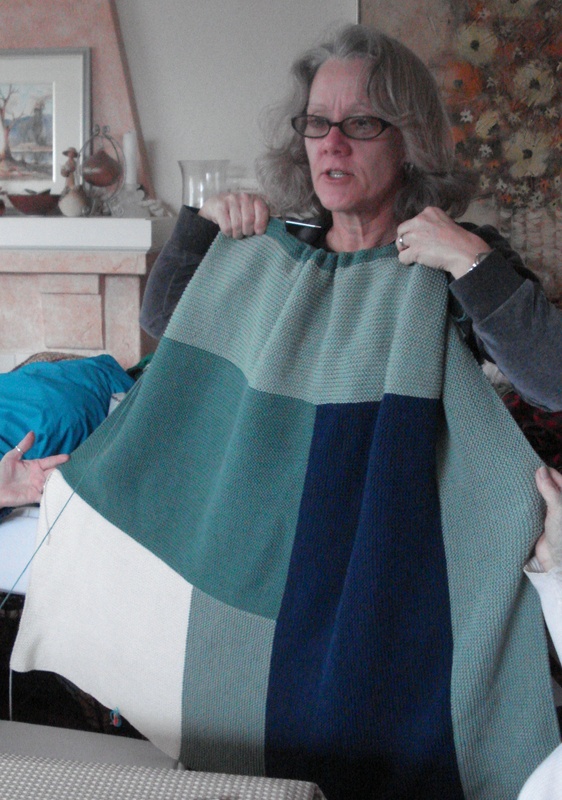 Diane’s second project is a blanket knit with Lion Brand yarn. I know it’s a gift…but I’ve forgotten who gets this lovely afghan. And we have another baby blanket. 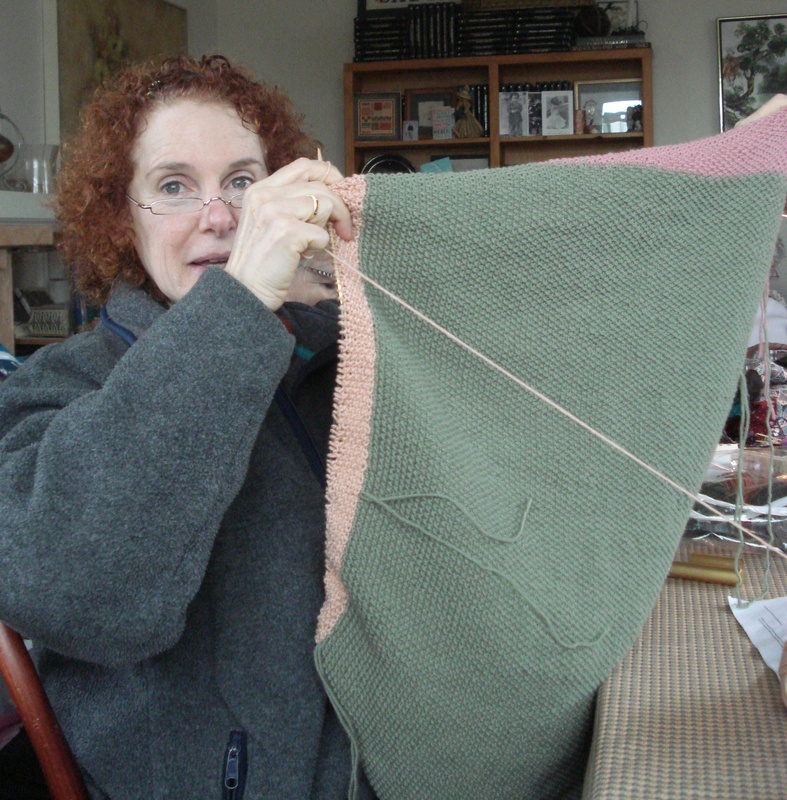 Shari is knitting with Debbie Bliss Baby Cashmerino. She loves the yarn…and is not excited about seed stitch. Now that she is nearing completion of this project, she thinks it’s wonderful…but a couple of weeks ago she described the project….”If I believed in heaven and hell, I would say that I am in knitting hell!” This brought rounds of laughter. In addition to the above projects there were many process – Cathy is using her yarn remmants to knit the most beautiful socks; Eleanor is working on socks for her husband Nick; Carol is knitting a scarf; Maggie is reworking her sweater – gauge was off (I’ll talk more about this in a future post). 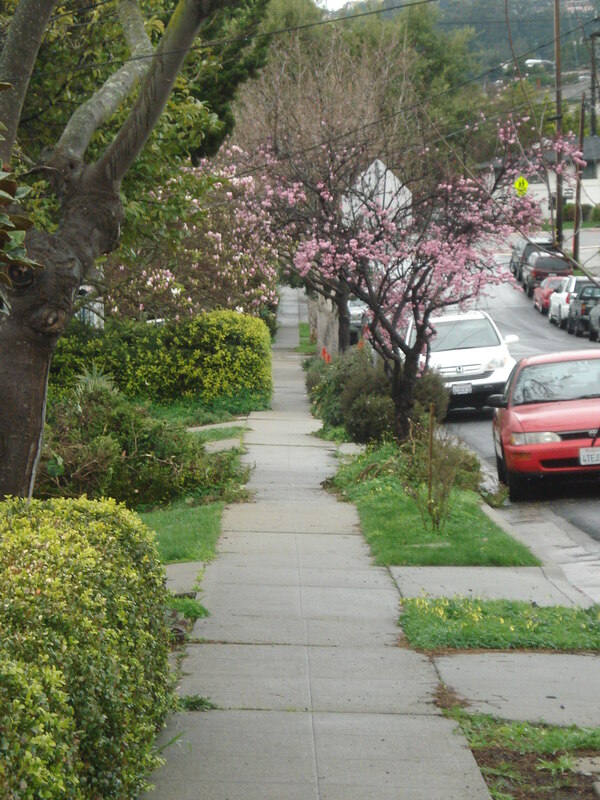 A hint of Spring – cherry blossoms! The book Mason-Dixon Knitting by Kay Gardiner and Ann Meador Shayne (friends and business partners because of the internet) was released in 2006 and has been the inspiration for many log cabin blankets to be knit. I have knit two – one for my youngest sister’s child and one for my lifelong friend Mary…friends since we were 12. And I have participated in many as we Skein Lane knitters have knit for the arrival of new babies within the groups. The joy and beauty of all them is that even though the design is simple, each one looks different. It’s all about fibers and colors. So, let’s take a look at few of them over the next few days. The most recent completion is one that Nina knit using Sugar ‘n Cream yarn…one of the cheaper and great cotton yarns. She edged the blanket with stockinette which rolls back over the body. This edge is different than the design from Mason-Dixon…and all the better..it’s about being inspired by books and patterns that we see. And then we can take off!